This morning, on my run, I had a revelation. I wasn’t particularly looking for a revelation – it just showed up. The power of it could have knocked me over – except it fully formed when I was sitting in my meditation tree in my back yard after my run – and it definitely brought tears flowing as I felt release from a long held story. The revelation? The story of survivorship is inextricably tethered to the story of victimhood. I haven’t thought much about being a survivor over the last year as I have mostly felt joy in this new phase of my life. On my run, I was feeling joy and inspiration, alive and vibrant, connecting to nature in the unseen ways that nature is also alive and vibrant. Feeling really good. Reflecting on events of the last week and a half that had me off my ground and my centre and then the three conversations/events that brought me back to my centre and a feeling of being myself. One of my friends offered me, very bluntly, an acknowledgement of the victim threads buried in the story I wrote to her. It highlighted it so brilliantly at first I was startled and then I laughed to see the truth of it. And seeing the truth of it released it. As I reflected on this experience this morning I realized I have lived into a story of survivorship probably most of my life, even before I was old enough to be consciously aware that that’s what I did. I survived the story of my birth (a story for another time), growing up in a small town (only half a joke), two divorces, an ectopic pregnancy, job loss under crazy and difficult circumstances, starting a company, merging businesses, separating businesses, difficult and challenging personal and work relationships. After all, the other choice was to be a victim. And God forbid that I would ever be a victim. I will always rise up and overcome whatever challenge shows up on my path. I am a survivor. I am strong. I am resilient. And this is all good. Except, of course, for my little revelation this morning. In order for the survivor story to be alive and well in me, the victim story is also alive and well but buried deep. Victim and survivor are contrasting sides the same story – two sides of the same hook. If it is only a choice between these two things, then of course, I want to be a survivor. But if the survivor story is alive and well in me, even if I have lost conscious awareness of it, then in order to be a survivor, I must attract circumstances and challenges to myself so I can continue to live into the story of being a survivor. The core of the revelation: without those challenges I am neither victim or survivor. There are not just two choices. There are a myriad of choices. I can live into my life, path and purpose with freedom, joy, love, eagerness and enthusiasm. I can still attract growth and contrast to my life, but they don’t need to be challenges. They can be offerings from which I can choose the path that path serves the joyful, delightful core that is calling me. I can accept, allow, receive. How much more powerful is that than choosing only between victim and survivor but to release that hook and choose a completely different story and unfolding of my life as this new phase is just getting started. Deeply grateful to friends, to nudges along the path and the beautiful shifting shape of my life, relationships and work that has only just begun. Hungry for more. Ready for more. This entry was posted in Leadership, Spiritual journey and tagged inspiration, joy, Kathy Jourdain, meditation, purpose, release, resilient, revelation, Shape Shift Strategies Inc., shifting shape, survivor, survivorship, truth, vibrant, victim, victimhood by Kathy Jourdain. Bookmark the permalink. I have come to a similar place Kathy. When I give up my need to struggle, the struggles no longer define me and I quit attracting them. Agreed Lea. And it never ceases to amaze me how attached we are to struggle in its various forms. Kathy – beautifully written and great insight . . .
That’s a powerful new awareness that’s emerging for you. I see parallels with people who are dealing with serious illness. While their goal is wellness, they may find that the illness is so powerfully at the centre of their life that they are, in fact, not looking for wellness but for un-sickness – a way of not being rather than a way of being. You identify some powerful elements in survival, such as strength, resilience, rising and overcoming. I wonder which elements in your survival framework best serve you and how they can be reframed into a powerful way of being rather than unbeing – the person who thrives rather than the person who is not destroyed? 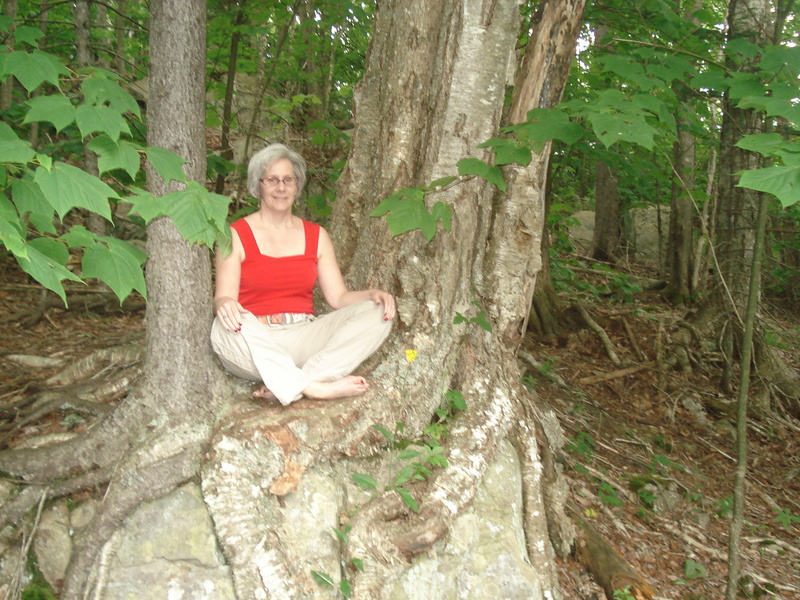 I love your meditation tree! I love my meditation tree and my backyard and how lovely and enlivening it was to sit out there on my deck for the first time this year. A powerful reminder of why this is my house. As for the elements identified through survival – what if they just are without being defined through that lens but are attributes that can joyfully and beautifully be stepped into in their own right. Now, that is powerful!